There was a time when foreclosure and distressed properties dominated the Greater Atlanta Housing Market. These homes were often abandoned properties that were not maintained, and in many cases had been stripped of the appliances and other items. Many homebuyers thought of these properties as uninhabitable, but to investors, they saw dollar signs. The banks were holding so many of these properties they were trying to unload them as fast as possible in order to minimize their loss. Although this wasn’t always the case, investors would buy these homes at a steep discount then do whatever repairs and updates needed to be done and then turned around and sold the properties at market value, or held onto them as rental properties building long-term wealth. In today’s market, there are far less real estate owned (REO) properties available so many of the banks are taking a different tactic when selling these foreclosed homes. Some banks are choosing to renovate these properties before listing them for sale with a Broker. This means far fewer deals are to be had for the investors, and for the homebuyer that wasn’t in a position to do all the repairs that may be needed after purchasing a foreclosure, they are now able to consider them as an option. As the market has improved over the past couple of years, the number of foreclosures for sale have been significantly reduced putting the banks in a stronger position to improve the properties if that is what is needed to sell for top dollar. Rather than trying to sell properties as quickly as possible, banks are now looking to minimize their losses. This, in turn, creates both risks and rewards for the homebuyers who are considering purchasing a foreclosure. The best way to make an informed decision is to weigh the advantages and disadvantages of buying a foreclosed property. 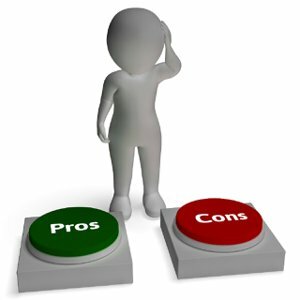 Below are some of the Pros and Cons of buying a foreclosure. Although many foreclosures are priced at or above market value, in some cases there are still homes are priced below market value but in today’s market, most, if not all of those homes will require repairs and/or updates of some sort. For investors and homebuyers that don’t mind completing the work, they may be a great option for saving or making money. Depending on the number of repairs that are needed, you may be able to complete the renovations and still be below market value with your investment. Foreclosures can be a great option for homebuyers looking to close on the home quickly. Banks normally get a clear title before putting the house on the market, and since the bank has already taken possession through foreclosure, homebuyers don’t need to be concerned with those two things holding up closing. REO properties are sold as-is, meaning, what you see is what you get. The bank normally will not do any repairs in order to sell the home. Since the bank knows nothing about the history of the home they are unable to provide a Property Disclosure or any other information about the history of the home. When buying an REO property, the banks will allow the buyer a due diligence period where they can have their inspections and do their homework about the neighborhood and area but that still may not disclose past issues and problems with the house. When you are dealing with a bank you are not dealing with a person who might consider your situation when making a decision. The banks don’t care about you, your reasons for wanting to purchase the home, or what you are trying to accomplish. For the bank there is no emotion in their decision-making process, it’s all about their bottom line. Although you can still occasionally buy a foreclosure at a discounted price, the banks are still looking to net as much as possible for these properties. For the bank, this is nothing more than a business decision if the numbers make sense they’ll make the deal, if not they won’t. Consider the time and effort required to complete the renovations and whether or not it is worth the time and effort it will take. Only you can decide if buying a foreclosure is a good fit for your current situation. Weigh the pros and cons, do your research, and work with a qualified professional like The Stadler Group to help guide you through the process so you can make the best decision for you.